As a kid I had never met anyone that had been in space. 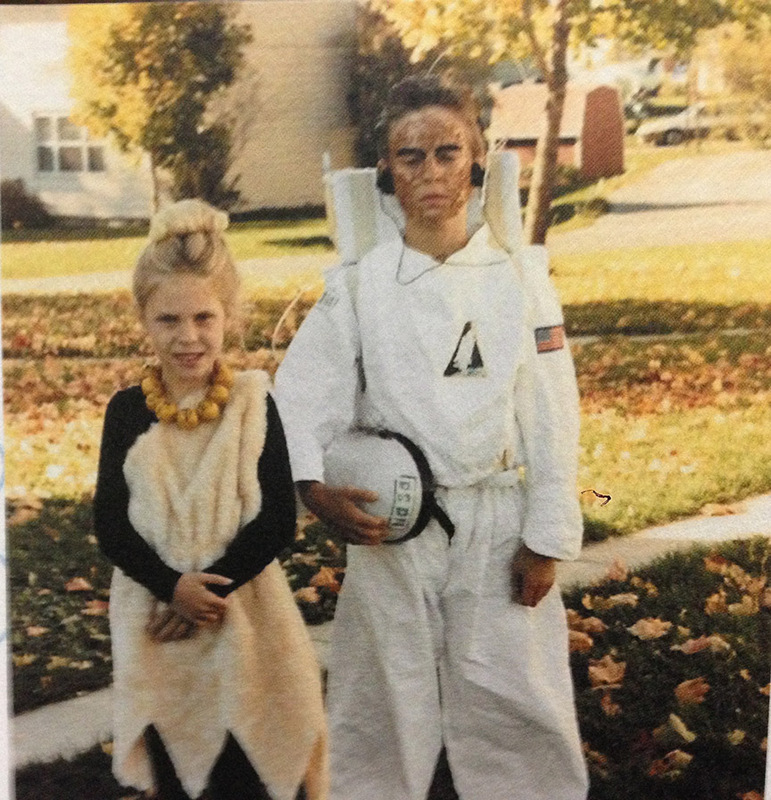 This is a photo of me dressed up as an astronaut for Hallowe’en (click the READ MORE button if you don’t see the photo). I’m probably around 10 or 11 (the cute little girl is my awesome kid-sister Jennifer, always outshining me in photos). The brown on my face is suppose to look like a radiation burn – evan as a kid I knew that being an astronaut was a very dangerous, yet exciting, job. I had never met anyone who had been in space. I remember watching the Space Shuttle ‘Challenger’ tragically explode live on TV as Christa McAuliffe was on that mission. She was selected among 11,000 applicants to be the first teacher in space. She had trained for months and almost every school in North America was showing the launch live in classrooms. Its a day, and image, I’ll never forget. I realized very young how brave astronauts must be. I grew up in a sci-fi family, we looked to our TV set and movie screens for our space needs (not the skies). My family were pretty proud nerds, still are – our church was Star Wars, E.T., The Last Star Fighter, V, and the X-Files. I had never met anyone who had been in space. We had a healthy interest in the great beyond, but I can’t say there was much scientific knowledge batting around in our space-debates. I had never met anyone who had been in space, until this year. 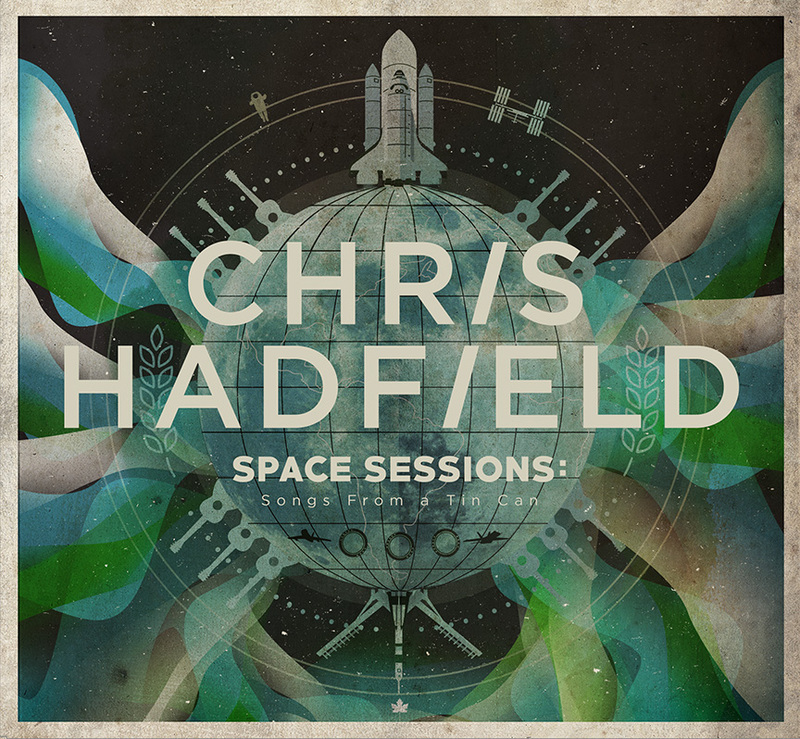 Imagine my excitement when I was asked to come up with concepts and designs for Canadian astronaut, and International Space Station Commander, Chris Hadfield’s debut album! I’d watched him sing David Bowie’s “Space Oddity” on the international space station (over 26 million YouTube plays so far). I watched him sing along with students from schools all across Canada live from the space station, and of course have seen the wave of popularity he’s received around the world that continues long after he landed back on earth. 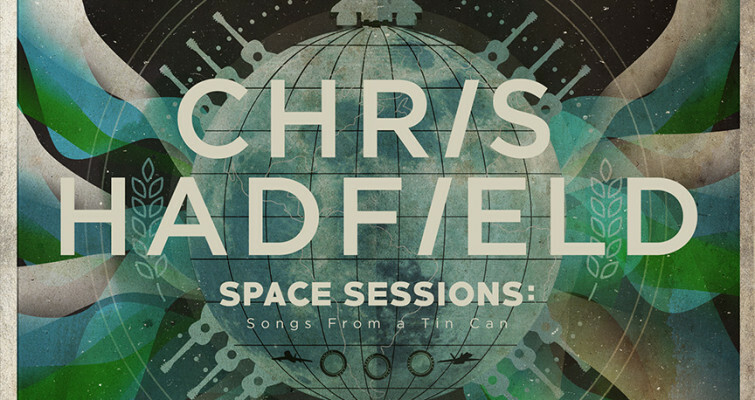 Commander Hadfield recorded the vocals and acoustic guitars for the album while on the International Space Station. This album is potentially the first piece of art created in space, or at least the first that would be available to the public. Did I want to work on this project? Hell yeah I did!!!! 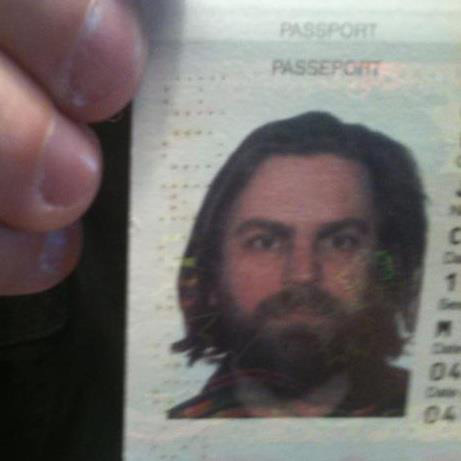 As luck would have it, Chris Hadfield was going to be in St. John’s, so we booked a face to face. I’ve been lucky to meet, and work with, a lot of incredible people, its been one of the perks to being a graphic designer and musician, but an astronaut?! Amazing! We sat and chatted about the album, his missions to space, being a test-pilot of Canadian fighter jets and his image appearing on our five dollar bill. I was immediately struck by how incredibly friendly Chris was. He was relaxed and casual, I tried to give off the presence that I was too. Just another day, right? haha, nope. I tried to stay on topic and ask questions about the album that would help me come up with artwork ideas, but I could tell Chris was comfortable talking about what most people want to hear when they have his ear, ‘space’. It was clear that this was probably my smartest client, no offence to other clients, but this guy exudes a level of intelligence and charisma that I’ve not encountered often. He’s an astronaut after all, they’re probably all good at math, science, sports, and stuff. We were joined by his son Evan, and nephew Aaron, who are part of Chris’ business team. It warmed my heart that this was a family operation. Very cool. The boys carry the same level of confidence and knowledge as Chris, I knew this was going to be a fun project. The meeting concluded with an elevator ride and the four of us said our goodbyes. My mind was racing – how do you design the first album recorded in space? This question stuck with me for a couple weeks. I really wasn’t sure what the answer was, but knew it would come to me. I set out on the first phase of every good design project, “research”. For a solid week I listened to every interview I could find of Chris Hadfield. I looking at hundreds of photos of his space travels, jet flights and speaking tours. I learned as much about his life as I could, his childhood and how he had decided at age 9 (around the same age I dressed up as an astronaut for Hallowe’en) that he wanted to be an astronaut and how almost every decision he made from that day forward were all made to move him closer to his goal. The album was produced by Robbie Lackritz, a music manager and producer whom I have worked with before. I called Robbie and we chatted at length about the album, Robbie’s impressions from the hours he has spent with Chris Hadfield, and where he thought the artwork should take things. Now with the research phase of the project coming to a close, I started to sketch some ideas. At first, I had thought to try a cover concept that didn’t focus on space themes. I wanted to make something that was a great album cover, and maybe there would be a subtle space reference somewhere, but overall it would be a Chris Hadfield album, not an astronaut’s album cover. I was sent the album’s music to listen to, and immediately realized that ‘space’ was a huge theme in many of the songs, so it only made sense to represent it on the cover. A sphere on a black background – the earth, the moon, orbit, Chris’ face… I wanted to represent the northern lights as Chris had said you see them dancing constantly in space. I looked to have elements that would speak to Chris’ childhood, growing up on a farm. And the steps in his career that led to this album, his love for Canada, the world, and Toronto’s Maple Leafs. Chris’ mustache has also become a part of his public personality, often times being referenced by fans. Was there a way to incorporate the mustache? In the end I decided against it, but not before trying a couple layouts that included a mustache, the cover was taking a serious tone and the moustache would have been too silly. Once I had my ideas organized, I sent them on to Chris and Evan to see what they thought. Evan replied saying he wasn’t sure if my concepts were quite right, he’d have to see it first. I started with some pencil sketches, which I’ll admit weren’t looking great. I was starting to doubt that this idea was going to work. Evan might be right. The only way to know for sure if I was on the right track, was to try it. I moved to the computer, and began using Adobe Illustrator, and the cover began to take shape. My starting point showed potential and I knew I was on the right track. I developed the concepts much further from here, but once seeing this initial layout I felt I was heading in a good direction. It took three or four days to flush out all the colours and elements. I immediately sent off the Chris and Evan. I wanted viewers of this cover to feel something. I wanted it to look like classic war-time poster designs, but also the science fiction novels and comics of the ’50s and ’60s. After 24 nerve-wracking hours word came in and they liked the cover. Phew! Chris pointed out some subtle details I had gotten wrong: The space-walking astronaut has wearing a jet pack, and Chris didn’t use one of those packs on his space-walks, so I removed it. He also noted that the small fighter jets I illustrated were F16s, but he had actually flown F-18s and F-86s, so I replaced them with the new models. And lastly, I had depicted a NASA shuttle, which Chris had flown on his first two space missions, but on his third he flew a Russian Soyuz rocket, and asked if I could include one of those. How cool was this? I was discussing the differences between fighter jets and rocket ships with a man who has actually flown all of them. Once we had a cover that the boys all liked I wanted to send it to the album’s producer, Robbie. I was actually more nervous of what his reaction would be than anyone else involved. Robbie is VERY good at what he does. He’s an amazing music producer, and equally amazing band manager. I’ve worked with him before and his ideas had always been a couple years ahead. He has asked me to do things that I had never seen before and didn’t think were possible, and I’d figure it out. Thankfully he liked the artwork as well. Cover is done. On August 7th the album was announced and made available for pre-sales. Social media errupted with comments of love and excitement for the album and its cover. David Bowie posted about it on his website and social media which of course applified everyone’s excitement. Newfoundland audiences showed me a lot of love as there are many Commander Hadfield fans here. My favourite congratulation came from my niece Kiera however, who made this drawing and got every detail perfect (Thanks Kiera!). There’s a lot more to this story, but I’ll save that for when the album comes out – don’t want to potentially post any spoilers. Huge thanks to Commander Hadfield, Evan and Aaron for the opportunity. This has been one hell of an exciting project both as an artist, and a fan. Click here for more PROCESS STORIES of projects I’ve worked on. Hi Jud, Long way from babysitting. I always remember how highly Mom spoke of you. Congratulations on a great job. Those were the days, drawing pictures after the kids went to sleep on babysitting jobs. Nice hearing from you again Maryann! I love The music and I love your Cover art. I sketched out my interpretation of the album and posted it to his FB pages. I am also an artist and always interested in other artist’s process…in case you are interested, here is what I’m working on. I’m Dan Tomberlin. I’m an artist and would like you to consider funding my project I am calling The Studio Elsewhere Project. This was an incredible story, and a great glimpse at your process. Thanks for sharing! No problem Meghan – its all in good fun. See you soon. When I saw the first post with this cover design, my genuine reaction was ‘I really like that artwork’. I think you’ve managed to combine wartime poster style and 50/60s retro sci-fi feel really well. It was interesting to read about the back story. Great job! Hi Jud! 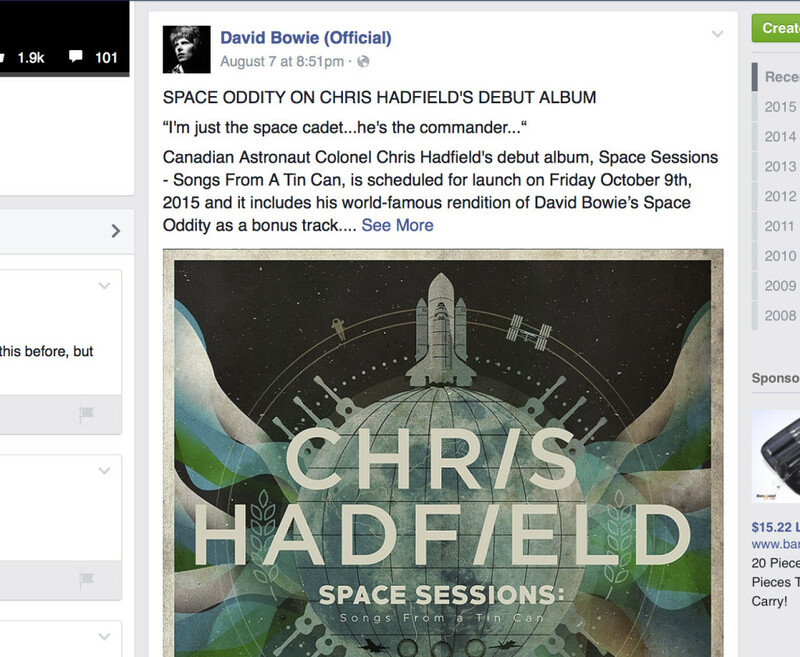 My husband is a huge fan of Chris Hadfield–we actually played his version of “Space Oddity” at our wedding. I heard about this post through Chris Hadfield’s facebook page, and while I read through it, I noticed…the “i” in “Chris” and “Hadfield” is angled to the right. Could you talk a little bit about that design choice? I really like it, but I’m curious what your intention was–obviously every design choice is deliberate, and this one is a neat (but unexplained) detail. 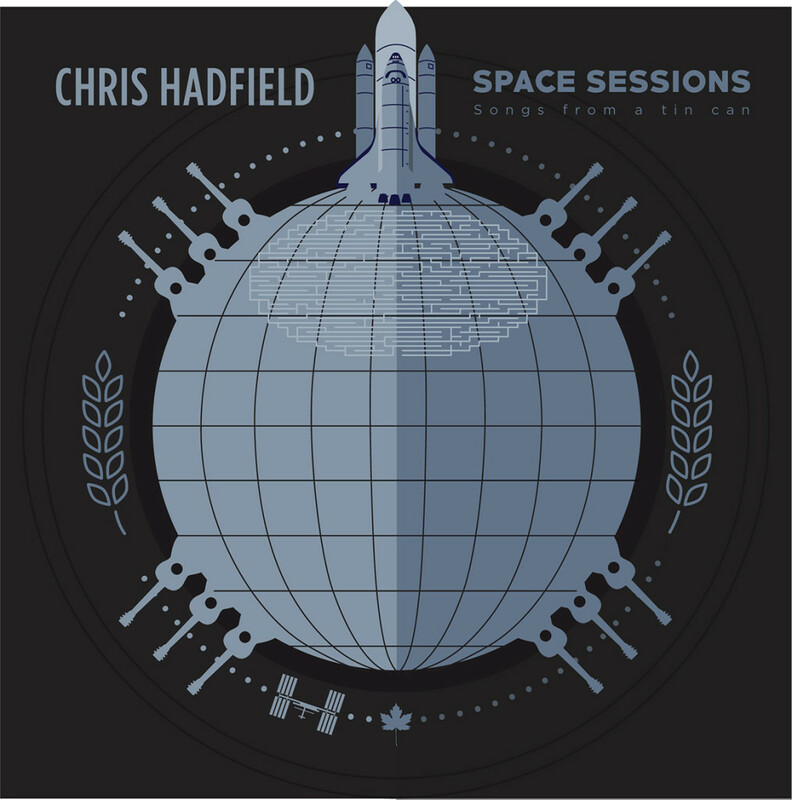 Hi Bailey – I didn’t get too much in to why I italicized the two “i”s in Chris Hadfield’s name as it was the only design item on the cover that didn’t really have a conceptual purpose. I liked how it looked, and was pleasantly surprised that the two letters lined up perfectly when italicized, to make a forward moving line. I could have easily justified it by saying it shows a forward moving life path, or something like that, but in all honesty it just looked kind of cool, and offered a little bit of uniqueness to the simple typography used on this cover. Thanks for the comments – say high to your husband and happy holidays! 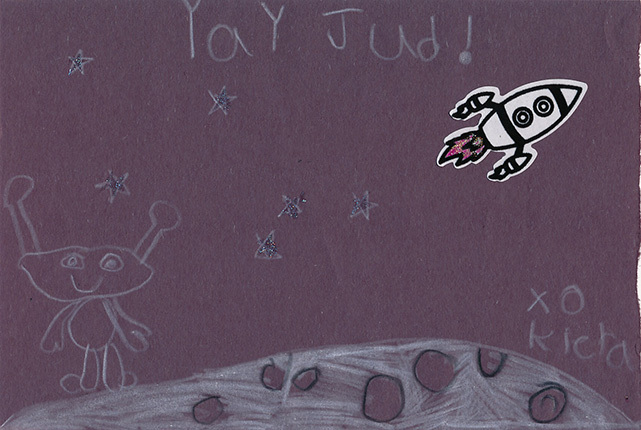 Hey Jud, awesome project. Really interesting to read how it came together and a great result. Thanks James! I just checked out a bunch of your work as well, really amazing! Love your logo work especially!